In 1832, (the year of the Reform Act), Newport Corporation granted the Churchwardens and Overseers a 30 year lease on a piece of land alongside the river Medina between today's Coppins Bridge roundabout and the 'lift' bridge onto the eastern quay. This land was developed into the Reform Wharf at which coal for the poor could be delivered without payment of any wharfage dues. 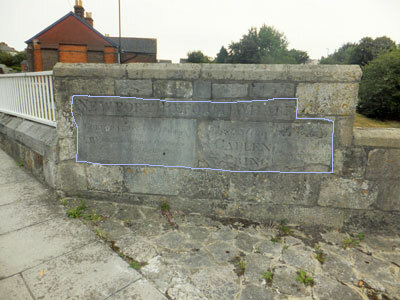 All signs of the wharf have long since disappeared apart from the inscribed stone blocks which formed part of the wharf and which are now incorporated in the parapet of the Coppins Bridge pedestrian bridge at the bottom of Newport High Street.